We walked out of the Bali Hai EAST, not Bali Hai Hotel and flagged down a bus passing on the road with a sign in the window. 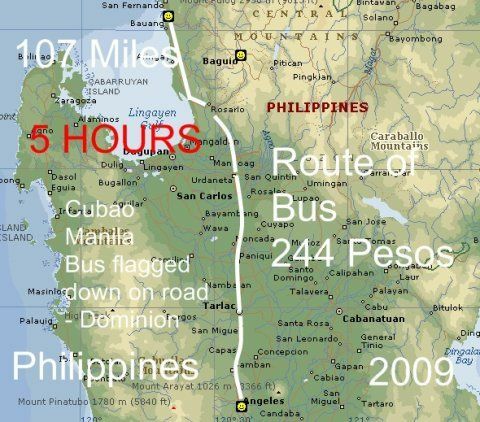 “Cubao Manila.” That took a half hour, then sat another five hours to go 107 miles, this is crazy, and we averaging about 20 miles per hours in the Philippines. 107 Miles took us Five hours. It takes five hours of travel time and about an hour on each end, so from Hotel door to Hotel door is at least seven hours. WARNING - Wear long pants, jacket and maybe carry a blanket on any bus in the Philippines, it is possible you will freeze to death. The air conditioners are often weirdly cold. The Philippines is a never-ending city alongside a two-lane highway, there is no way to go faster, the tricycle taxis, jeepneys, and general traffic goes at 20 miles per hour. You are traveling as fast as a Tricycle Taxi, that is about top speed. We must have passed 300 cars, trucks or motorcycle taxis; in a private car or shuttle, you are a candidate for a head on collision. I personally believe my seat on a huge bus is safest. 244 Pesos one-way from with Dominion Bus lines from Bauang to Dau. This small city is really part of Angeles City, then you need to take a Tricycle Taxi for about 100-150 Peso to your hotel, good luck…. 250 Peso for a Partas Bus from the Dau or Angeles City to Bauang, just say you are getting off at Bali Hai, they all seem to know the place. - Baked or cooked on this bus. You are not going to Clark or Angeles City; you are actually going to the Dau Bus Station, which is just a part of the never-ending city of Angeles City. We went to the Airport, I cannot tell you an easy way to get to the airport, it was a Charlie Foxtrot, we ended up hitching in, and I hitched out. There was no public transportation leaving the airport when I needed to leave, I walked out, a couple of security guards picket me up, ask me 350, I gave them 100 and I was back in Angeles City.